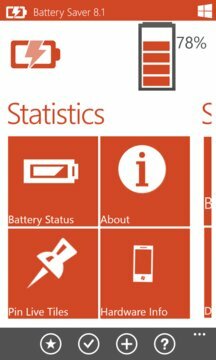 Battery Saver 8.1 is powerful and easiest battery manager app, exclusively designed and developed for Windows phone 8.1 devices to extend battery life, optimize using habit and mobile hand-on experience. Battery Saver 8.1 now provides you the best solution. The tool includes 4 most effective saving modes. Select one mode according to your situation, the problems will go away. 1) Default Saving Mode ► Conserves battery when it gets low. Phone turn offs some services to help preserve battery life. It automatically turn offs the apps that are consuming power in the background. 2) Normal Saving Mode ► manages the eight different controls and smart to save more battery than Default saving mode. It saves 15 to 25 % of battery life. 3) Super Power Saving Mode ► gives 25 to 40 % of additional battery time through 6 personalized options. 4) Instant Saving Mode ► stops discharging instantly and helps you to save battery for crucial moments like when you are travelling or stuck in a difficult situation. No matter in what situation, no matter who you are. Battery Saver 8.1 will always find the best solution for you. ✔ Technical Support for solving battery Issues. ✔ Battery Status with Live tile. ✔ 8 different live tiles for amazing features. ✔ Customization with both light and dark themes. 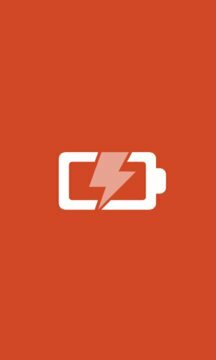 ✔ 4 Battery Saving modes with live tiles. ✔ Extend the battery working life. This Promotional offer is limited time offer.